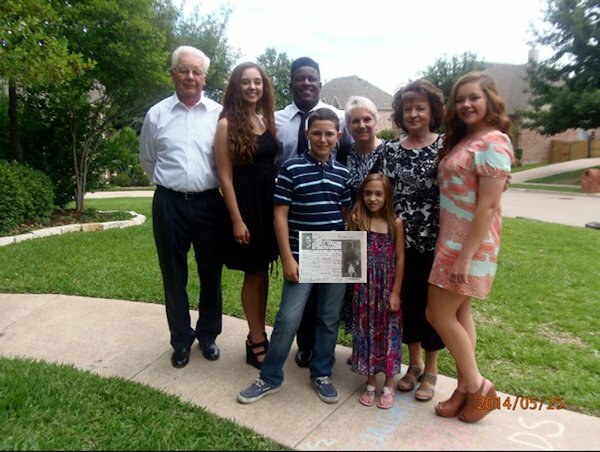 Charles and Claudia Apt of La Harpe took "The Quill" along to Keller, Texas to be a part of their grandkids graduation. Jackie Earle (John's mom) flew in from New Jersey to attend the ceremony, too. Samuel and Alexis graduated on May 25, 2014 from Birdville High School. Both will be heading off to school in the fall. Samuel will be attending Coffeyville College in Kansas on a football scholarship. Alexis will be heading to New Jersey in the fall to study Nursing. With the Quill is from left: grandfather Charles Apt, graduates Alexis and Samuel Earl, with the Quill Stone and Gabby Earl, grandmothers Jackie Earle and Claudia Apt, and Ali Earle.When you go on a trip, take "The Quill" along and have your picture taken with it and then send it to us. Let's see where all "The Quill" can travel.